Precision CNC Turning of a Steel Ring Step O.D. 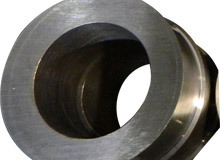 At Alloys Unlimited & Processing, weve been providing precision machining services to customers in a wide range of industries for more than two decades. Recently we were contracted to manufacture this steel ring step, which was designed for use in the automotive, oil, gas, and power industries. Composed of 4140 steel the ring step featured an outside diameter of 10", an inside diameter of 3", and 7" in length. 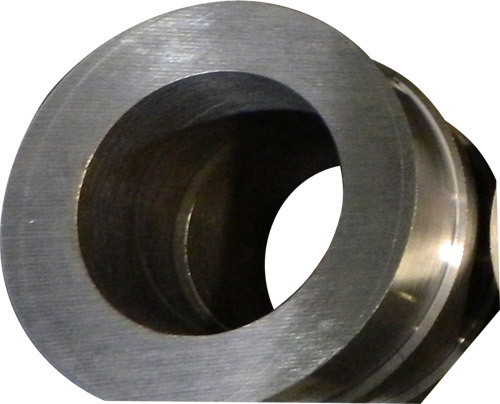 This part was manufactured utilizing our advanced CNC turning capabilities, which were easily able to hold the required tolerances of ±0.125". For more information on this precision CNC turning project, see the table below or contact us directly. Precision CNC Turning of a Steel Double Step Crankshaft with Blind I.D. Overall Part Dimensions O.D. : Ø 10"
Product Name Ring Step O.D. Site created by Thomas Web Solutions© 2015 Alloys Unlimited and Processing, LLC, All Rights Reserved.